Oh look, a beautiful bit of churchy stained glass in a window. That’s no moon stained glass. 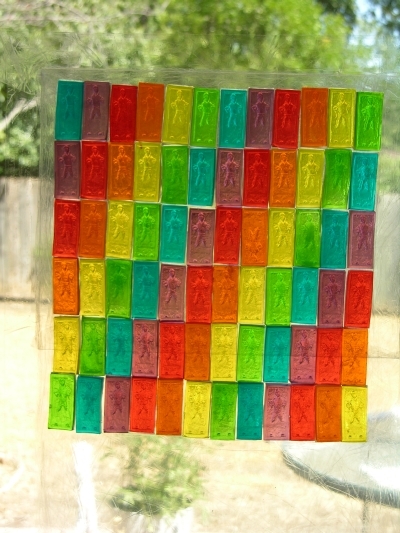 It’s a space station bunch of gummies. 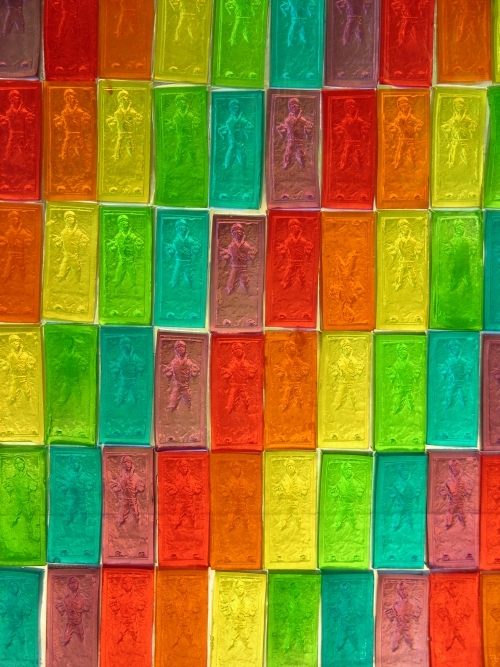 It’s a bunch of Han Solo in Carbonite gummies in rainbow colours made to look like stained glass. Crap, one of 'em is upside down. Click for a larger pic. Yes, I am that wrong. The idea came to me and I was amused, so I did it the day before I went down to the Houston cake club’s Day of Sharing (more on that later) so I could serve up these and the remainder gummies made from each colour batch to the attendees. 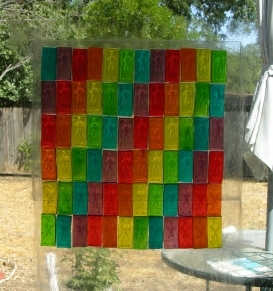 I covered some acetate sheets in plastic wrap and stuck the gummies on, then put another sheet over the top to hold them there and used packing tape to tighten the sides and stick the whole business on our back door. This entry was posted in Experimental Techniques, General Freakishness, Gummy, Severe Nerdery, Sick and Twisted. Bookmark the permalink.